International volunteers enjoying a seminar in the CRRU classroom. 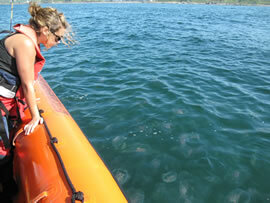 Why are jellyfish increasing in our seas? Climate change or overfishing? 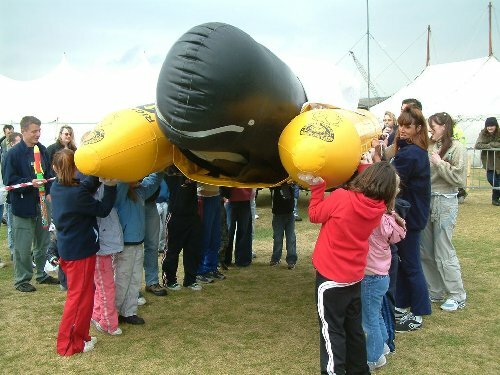 Young volunteers helping to refloat "Moby" the pilot whale during a public demonstration at a northeast show. 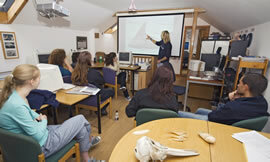 In addition to the marine research and rescue activities of the CRRU, the charity also undertakes a rigorous educational programme throughout the year, and is actively involved with schools, colleges and universities – providing work experience opportunities, internship positions and university project placements for Bachelors and Masters students throughout the year. The CRRU's Summer Field Courses are also an excellent way to become actively involved in the Charity's work, and these are run between May and October each year from the Scottish fieldbase in Gardenstown, Banff. The team also conducts numerous school visits, public talks, training courses, demonstrations and media work on a month to month basis, as part of its extensive community and national outreach programme.